As of March 27, 2009, Treasury had disbursed $303.4 billion of the $700 billion in TARP funds. Most of the funds (about $199 billion) went to purchase preferred shares of 532 financial institutions under the Capital Purchase Program (CPP)—Treasury’s primary vehicle under TARP for stabilizing financial markets. Treasury has continued to take significant steps to address all of the recommendations from our December 2008 and January 2009 reports. In particular, Treasury has recently expanded the scope of the monthly CPP surveys of the largest institutions to include all institutions participating in the program, which is intended to provide Treasury with information necessary to begin to track the effectiveness of the program. Treasury also continued to make progress in several other areas, including requiring firms participating in certain new programs to show how assistance will expand lending. These requirements will better enable Treasury to determine what institutions plan to do with any capital infusions and to track the resulting lending activity of participating institutions on a regular basis. In addition, we specifically found that though Treasury is now receiving dividends from the investments it has made in CPP and certain other programs, it has not publicly reported these receipts, which totaled almost $2.9 billion through March 20, 2009. We recommended that Treasury could improve transparency pertaining to TARP program activities by reporting publicly the monies, such as dividends, paid to Treasury by TARP participants. In February 2009, Treasury announced its broad strategy for using the remaining TARP funds and provided the details for its major components in the following weeks. Specifically, Treasury announced the Financial Stability Plan, which outlined a comprehensive set of measures to help address the financial crisis and restore confidence in our financial markets, and a Homeowner Affordability and Stability Plan to mitigate foreclosures and preserve homeownership. While articulating its plan was an important first step, Treasury continues to struggle with developing an effective overall communication strategy that is integrated into TARP operations. Without such a strategy, Treasury may face challenges, should it need additional funding for the program. Therefore, in our March 2009 report, we have recommended that Treasury develop a communication strategy that includes building an understanding of and support for the various components of the program. Specific actions could include hiring a communications officer, integrating communications into TARP operations, scheduling regular and ongoing contact with congressional committees and members, holding town hall meetings with the public across the country, establishing a counsel of advisors, and leveraging available technology. Also, while Treasury has announced up to $70 billion dollars in assistance to AIG—more assistance than has been announced for any other single institution to date—it has yet to disperse the up to $30 billion of additional assistance or finalize the agreement. Therefore, Treasury has an opportunity to further improve the integrity and accountability associated with this announced additional assistance. In our report, we recommended that Treasury require that AIG seek to renegotiate existing contracts with management, employees, and counterparties, among others, as appropriate, as it finalizes its agreement for the up to $30 billion in additional assistance announced on March 2, 2009. Treasury has also made progress in establishing OFS and continued to take steps to address our previous recommendations related to OFS’s management infrastructure, including hiring, contract oversight, and internal control. First, it has continued to hire additional permanent staff to address OFS’s long-term organizational needs. As of March 20, 2009, OFS had 113 total staff, with the number of permanent staff increasing substantially—from 38 to 77—since our last report. Second, Treasury has enhanced its capacity to manage vendors by using trained oversight personnel and looking for opportunities to use fixed-price arrangements. Further actions are needed to complete its review of existing vendor conflicts of interest mitigation plans and to improve its documentation of decisions related to potential conflicts. Consequently, we made two new recommendations to Treasury—(1) complete its review, and, as necessary, renegotiate, the four existing vendor conflict of interest mitigation plans to enhance specificity and conformity with the new interim conflicts of interest rule, and (2) issue guidance requiring that key communications and decisions concerning potential or actual vendor-related conflicts of interest be documented. Third, OFS continued to refine, develop and document its internal control framework over financial reporting and compliance, including its risk assessment activities. However, we found that OFS documentation of certain internal control procedures and guidance pertaining to determining warrant exercise prices had not been updated to be consistent with actual practice. As such, we recommended that Treasury update OFS documentation in these areas to be consistent with actual practices applied by OFS. We continue to note the difficulty of measuring the effect of TARP’s activities. Developments in the credit markets have generally been mixed since our January 2009 report. Some indicators revealed that the cost of credit has increased in interbank and corporate bond markets and decreased in mortgage markets, while perceptions of risk (as measured by premiums over Treasury securities) have declined in interbank and mortgage markets and risen in corporate debt markets. In addition, although Federal Reserve survey data suggest that lending standards remained tight, the largest CPP recipients extended almost $245 billion in new loans to consumers and businesses in both December 2008 and January 2009, according to the Treasury’s new loan survey. However, attributing any of these changes directly to TARP continues to be problematic because of the range of actions that have been and are being taken to address the current crisis. While these indicators may be suggestive of TARP’s ongoing impact, no single indicator or set of indicators can provide a definitive determination of the program’s impact. Finally, I would like to express my thanks to Chairman Baucus and Senator Grassley for introducing S. 340, the Troubled Asset Relief Program Enhancement Act of 2008, and Senator Snowe for co-sponsoring this bill. It would enhance GAO’s ability to bring accountability and transparency to the TARP program by providing us with direct access to the companies that receive TARP funds. Another TARP access issue for GAO involves the growing role of the Federal Reserve. On March 3, 2009, Treasury and the Federal Reserve launched TALF—the Term Asset-Backed Securities Loan Facility—which is a lending program to increase the availability of credit for consumers and businesses. More recently, the Federal Reserve and Treasury announced plans to expand the role of TALF as part of a new Public-Private Investment Program. Finally, Treasury and the Federal Reserve have coordinated in the restructuring of federal assistance to AIG. For all of these joint endeavors, GAO has authority to oversee the activities of Treasury, but not the Federal Reserve, because the Banking Agency Audit Act specifically precludes us from auditing the Federal Reserve’s monetary policy and discount window operations. We would fully support legislation to provide GAO with audit authority over those activities, together with appropriate access, recognizing the sensitivity of this area and the need for careful drafting. Treasury has taken appropriate actions to bolster the conditions or requirements for assistance that is deemed exceptional, but certain assistance may require that it go farther to help repair damage caused to the program. Controversies about the actions of some TARP participants continue to create issues for the program, in general, and AIG, in particular. While Treasury has announced $70 billion dollars in assistance to AIG—more assistance than has been provided to any other single institution to date—it has yet to disperse the up to $30 billion of additional assistance or finalize the terms under which the assistance will be provided. Therefore, Treasury has the ability to further improve the integrity and accountability associated with this additional assistance, announced in March 2009. 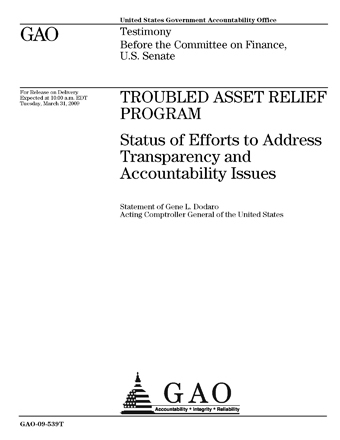 Based on our previous work on government assistance to the private sector, as well as the Treasury Secretary’s position, as articulated in the Financial Stability Plan, that “government support must come with strong conditions,” Treasury has an opportunity to take additional steps to strengthen its agreement with AIG by requiring AIG to seek concessions from management, employees, and counterparties before the agreement is finalized. For example, Treasury could require that AIG seek to renegotiate contracts with its employees, as appropriate, such as those related to the retention bonuses provided to AIG Financial Products and existing counterparties that would face substantial losses were AIG to have its credit downgraded or fail. While we understand that Treasury is making an investment in AIG, Treasury’s failure to act in this instance could cause additional harm to the program’s reputation and impair its ability to seek additional funding for the program if it were to need it in the future. We recommended in our March 2009 report that Treasury require that AIG seek to renegotiate existing contracts with management, employees, and counterparties, among others, as appropriate, as it finalizes its agreement for the up to $30 billion in additional assistance, announced on March 2, 2009. Following the announcement of Treasury’s Homeownership Affordability and Stability Plan, in March 2009, Treasury released information on its Making Home Affordable Program. One of its components—the Home Affordable Modification Program (HAMP)—will use $50 billion in TARP funds to modify mortgages. According to OFS officials, Fannie Mae and Freddie Mac will provide an additional $25 billion for a total of $75 billion to assist up to 4 million homeowners in order to avoid potential foreclosure.3 The Making Home Affordable program also includes a non-TARP funded initiative to help up to 4 million to 5 million homeowners refinance loans owned or guaranteed by Freddie Mac and Fannie Mae at current market rates. According to Treasury, this initiative could help homeowners save thousands of dollars in annual mortgage payments. Treasury worked with other agencies to estimate the cost and number of borrowers that would be eligible for loan modifications under HAMP and to design program parameters. On March 19, 2009, in order to reach out to borrowers, Treasury launched a Making Home Affordable Web site, which, among other things, provides program, eligibility, and housing counselor information. While the basic structure of HAMP has been announced, as of March 23, 2009, Treasury had not specified several components of the program, including a system of internal controls over TARP funds used to make loan modifications. According to Treasury, it plans to put in place such a system of internal control by the time the first payments are due to servicers. In addition, as of March 20, 2009, Treasury had not provided specific information on incentive payments, which servicers and mortgage holders/investors would be eligible for under HAMP. We will continue to monitor the design and implementation of this program, with a particular focus on the empirical basis for HAMP and the structure and effectiveness of its system of internal control. Treasury also established the Auto Industry Financing Program (AIFP) in December 2008 to prevent a disruption of the domestic automotive industry that would pose systemic risk to the nation’s economy. Under this program, Treasury has lent $13.4 billion to General Motors (GM) and $4 billion to Chrysler to allow the automakers to continue operating while working out details of their plans to become solvent, such as achieving concessions from stakeholders. The loans were designed to allow the automakers to operate through the first quarter of 2009 with recognition that, after that point, GM and Chrysler would need additional funds or have to take other steps, such as an orderly bankruptcy.4 As required by the terms of their loan agreements, GM and Chrysler submitted restructuring plans to Treasury in February that describe the actions the automakers will take to become financially solvent. Because of the continued sluggish economy and lower than expected revenues, GM and Chrysler are requesting an additional $16.6 billion and $5 billion in federal financial assistance, respectively. On March 30, Treasury announced that it had determined the plans GM and Chrysler submitted were not viable and would give GM 60 days and Chrysler 30 days to take additional steps to restructure their companies. Treasury said that it would provide the companies with interim financing during this period. As part of our oversight responsibilities for TARP, we are monitoring Treasury’s implementation of AIFP, including the development of the required restructuring plans. Finally, we again note that while isolating the effect of TARP’s activities continues to be difficult, conditions appear to have generally improved in various credit markets since the announcement of the first TARP program. However, some indicators demonstrate that, since our January 2009 report, the cost of credit continues to increase in interbank and corporate bond markets and decrease in mortgage markets, while perceptions of risk (as measured by premiums over Treasury securities) have declined in interbank and mortgage markets and risen in corporate debt markets. In addition, although Federal Reserve survey data suggest that lending standards remained tight, the largest CPP recipients extended over $240 billion in new loans to consumers and business in both December 2008 and January 2009, according to the Treasury’s new loan survey. Attributing any of these changes directly to TARP continues to be problematic because of the range of actions that have been and are being taken to address the current crisis. While these indicators may be suggestive of TARP’s ongoing impact, no single indicator or set of indicators will provide a definitive determination of the program’s impact.